Using a Split/Splitless Inlet This inlet is used for split, splitless, pulsed splitless, or pulsed split analyses. You can choose the operating mode from the inlet control table. The split mode is generally used for major component analyses, while the splitless mode is used for trace analyses. The pulsed splitless and pulsed split modes are used for the same type of analyses as split or splitless, but allow you to inject larger samples. Standard and high-pressure versions The standard split/splitless inlet is rated to 120 psi pressure at the gas supply fitting. It is appropriate for most columns. The high-pressure inlet is rated to 170 psi pressure—it is useful with very small diameter capillary columns that offer considerable resistance to gas flow. To determine the version that you have, press [Front Inlet] or [Back Inlet], scroll to the Pressure line, and press the [Info] key. The display will show the pressure range for the inlet—either 1 to 100 psi (for the standard version) or 1 to 150 psi (for the high-pressure version). Septum tightening For the standard septum retainer nut, an internal spring in the septum retainer applies pressure to the septum. For inlet pressures up to 100 psi, tighten the retainer until the C-ring lifts about 1 mm above the top surface. This is adequate for most situations. If using a Merlin Microseal™ septum, finger tighten the septum nut, until snug (not loose). The pressure capacity depends on the septum used. Split mode pneumatics During a split injection, a liquid sample is introduced into a hot inlet where it vaporizes rapidly. A small amount of the vapor enters the column while the major portion exits from the split/purge vent. The ratio of column flow to split flow is controlled by the user. Split injections are primarily used for high concentration samples when you can afford to lose most of the sample out the split/purge vent. It is also used for samples that cannot be diluted. 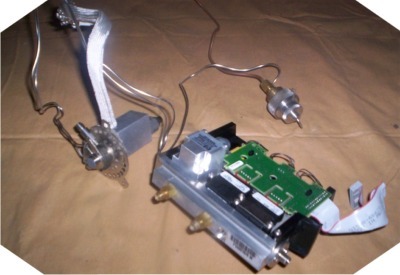 Splitless mode pneumatics In this mode, the purge valve is closed during the injection and remains so while the sample is vaporized in the liner and transferred to the column. At a specified time after injection, the purge valve opens to sweep any vapors remaining in the liner out the split vent. This avoids solvent tailing due to the large inlet volume and small column flow rate. Specify the purge time and purge flow rate in the inlet control table. Description HP Part No. Qty.